A filet of salmon on a chopping board. Sockeye salmon, Oncorhynchus nerka, are red salmon found in the north Pacific Ocean. They are often termed wild Alaskan salmon. A good source of protein, wild salmon is high in antioxidants, rich in omega-3 fatty acids, low in saturated fat and free of detectable mercury. 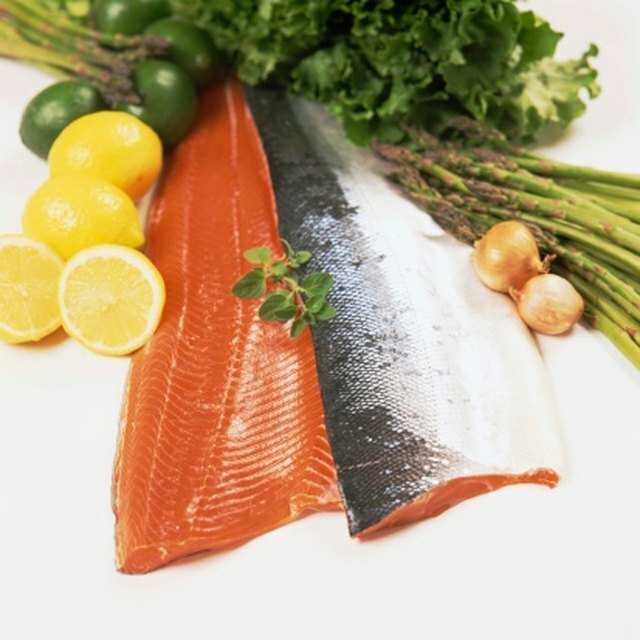 Sockeye salmon has beneficial amounts of vitamin B complex, vitamin E, magnesium, phosphorus, selenium and zinc. It is also one of the few protein sources with alkaline rather than acidic properties. The good fats in the salmon provide numerous health benefits. Sockeye salmon contains two antioxidants: vitamin E and astaxanthin, the natural pigment that produces the red color of salmon flesh. These antioxidants neutralize free radicals, unstable molecules in the body that can lead to cancer and arthritis. Astaxanthin is a carotenoid nutrient. 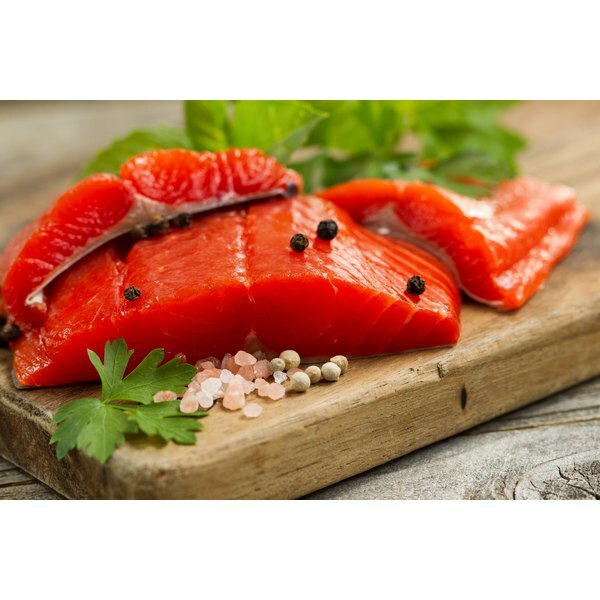 The major benefits of sockeye salmon lie in its high content of the omega-3 fatty acids, eicosapentaenoic acid (EPA) and docosahexaenoic acid (DHA). In the body, omega-3 and omega-6 fatty acids modulate inflammation, immune response and the electrical excitability of heart and brain cells. Omega-3 exerts powerful benefits, some of which are mentioned below. Atrial fibrillation (AF) is an abnormal beating of the heart, named arrhythmia. Regular consumption of sockeye salmon can stop arrhythmia before it triggers sudden death from a heart attack or thromboembolic stroke. J.K. Virtanen and colleagues treated 2,174 men for 17.7 years. They concluded that omega-3 in blood serum may protect against AF. A review of research trials by B.J. Holub emphasized the role that DHA in fish plays in reducing risks for heart atherosclerosis and sudden cardiac death. In a formal statement, A.P. Defilippis and colleagues at the Johns Hopkins Ciccarone Center for the Prevention of Heart Disease recommend eating fatty fish for cardiovascular disease prevention. The fats essential for brain activity (brain food) are EPA and DHA. These fatty acids are being studied in mental conditions, ranging from depression and bipolar disease to Alzheimer’s disease. In a study published in January 2010, J.G. Robinson and colleagues report that omega-3 maintains cognitive function in aging individuals. Wild sockeye salmon and farmed salmon are the two major types of salmon available for consumption. Wild salmon are caught from cold-water oceans. Kept in pens, farmed salmon cannot eat marine organisms, and they are subjected to less desirable conditions than are wild salmon. Researcher M.G. Ikonomou and co-workers published their findings in January 2007 on flesh quality of farmed and wild British Columbia salmon. They examined salmon with respect to concentrations of polychlorinated biphenyl compounds, total mercury and other toxic compounds. Their research showed that the toxin levels were less than the level of concern for consumption of fish as established by Health Canada and U.S. Food and Drug Administration. Melody Horner's more than 20 years as an editor includes writing hospital committee minutes at UCLA Medical Center and nutrition fliers for the Getty Museums. She is a nutrition counselor in Culver City, Calif. Horner's accreditation in nutrition was awarded by the Institute of American Health Science. As a member of USA Dance, Inc., she promotes fitness through ballroom dance classes.